When I think of the Google Books initiative now, three things stick with me. The first is simply what an audacious idea it was – to digitize all the books. The second is that without it, the book literature is less accessible than the web literature, which seems a pity. Google Books has allowed fine-grained discovery over the topics, people, places and so on which otherwise would largely be hidden between the covers. WorldCat represents the holdings of thousands of libraries around the world. It is the best available proxy for the aggregate library collection and by extension for the scholarly and cultural record of which libraries are the steward. OCLC and WorldCat have played an important role in this shift also. 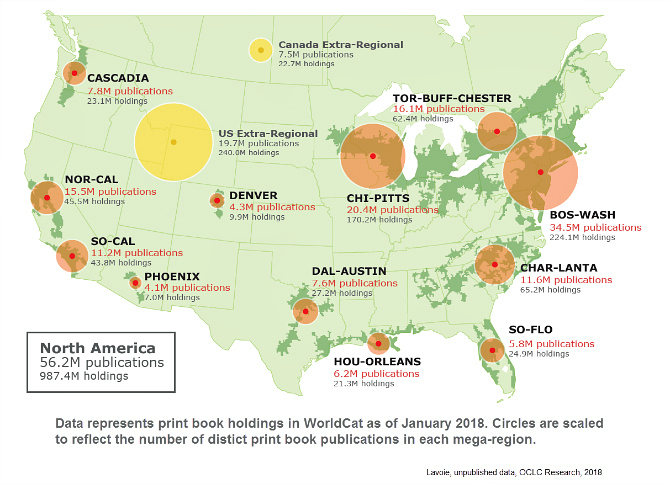 WorldCat represents the holdings of thousands of libraries around the world. It is the best available proxy for the aggregate library collection and by extension for the scholarly and cultural record of which libraries are the steward. In recent years, we have looked at providing an empirical base for discussions about that aggregate collection. This has meant that we can talk about the aggregate library collection or the collective library collection while having a real sense of its contours, in whole or at different levels (the collections in a particular region, for example, or the intellectual output of a particular country). While much of work has been in North America, we have also done work with library collections elsewhere. In fact, an important early analysis of this kind was of the original ‘Google 5’ libraries who participated in the ‘Google Print Library Project.’ The findings here have been confirmed over subsequent investigations, largely carried out by Constance Malpas and Brian Lavoie. Especially notable is the finding that, in my colleague Brian Lavoie’s words, rareness is common – many libraries do in fact have materials that are not widely held. Which in turn leads to the need to have wide library participation to ensure broad coverage of the published record (in resource sharing, digitization, or other initiatives). Brian has just written about some of that work – mining WorldCat for insights about the aggregate library collection and the characteristics of the scholarly and cultural record it represents. He presents an updated version of a map of library collections in the US and Canada, originally created several years ago by our colleague J.D. Shipengrover for our Print management at mega-scale report. This shows the concentration of library collections laid out over Richard Florida’s mega-regions framework.